Gadfly Records is proud to announce the release of ãKilroy Was Here,ä the debut solo release from Larry Kirwan, lead singer and songwriter for the popular Irish-American rock group Black 47. In addition to his work with Black 47, Kirwan is also a well considered playwright with 10 produced plays and musicals. With "Kilroy Was Here" he combines the experience of both worlds. Black 47 was formed in 1989 and has recorded six CDs for EMI, Mercury, Gadfly and Shanachie Records. They have performed almost 2000 shows internationally, appeared on all the major TV shows, shut down the town of Hoboken, played Shea Stadium three times and have been in the forefront of opening the eyes of a generation of young Americans to oppression in the North of Ireland and elsewhere. Kirwanâs cinematic songs of New York street life and political upheaval have been used in movies such as Into The West, The Break, The Saint of Fort Washington, Looking For an Echo, etc. and are staples in political and social TV documentaries. His plays have been performed widely in the U.S. and Europe. Five of them are published under the title Mad Angels. The best known, Liverpool Fantasy (what would have happened if the Beatles hadnât made it) will open in Liverpool in April, while the autobiographical The Poetry of Stone will be produced off-Broadway later this year. Kirwan is currently adapting Liverpool Fantasy to a novel. 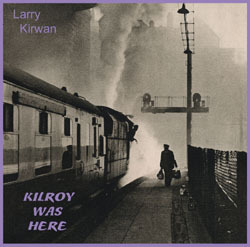 With "Kilroy Was Here," Kirwan chose a more intimate sound than Black 47, favoring violin and trumpet, while acoustic double bass powers the rhythm tracks. But, as usual, the songs are distinctive and evocative -- some autobiographical, others telling stories -- but all crafted with a playwrightâs skill and experience. The album features a number of guest artists. Suzzy Roche adds her haunting vocals to "Molly" -- a tale of a young man who falls in love with James Joyceâs greatest creation, Molly Bloom. Suzzy also adds immeasurably to a startling overhaul of Paul Simonâs "Only Living Boy in New York." Best selling novelist, and Kirwanâs former employer in the legendary Bells of Hell saloon, Malachy McCourt adds his curmudgeonly asides to the tongue-in-cheek revisionist "History of Ireland, Part 1." Lisa Gutkin of Whirligig and Klezmatics fame adds her gypsy violin to Spanish Moon, the strange tale of the murder of the poet, Lorca, and the ãcoincidentalä death of his companion a year to the day later. Displacement is the theme in "Fatima," in which an immigrant Muslim girl falls in love with a Christian and must decide on the claims of family or America. But the highlight of the album may be the moody "Lifeâs Like That, Isnât It?" when the writer describes how the return of his father from the sea introduces him to music and sends him careening from the stormy Ireland of the 60s through adolescence and civil upheaval to the ãsafeä haven of 42nd Street in New York. On a brief hiatus from Black 47, Kirwan will be touring the country in support of Kilroy in March/April and introducing acoustic Black 47 songs in vignettes from his one man show Rockin The Bronx. For press, contact Gadfly Records at or 802-865-2406 or Kirwan at blk47@aol.com. 6. Life's Like That, Isn't It?